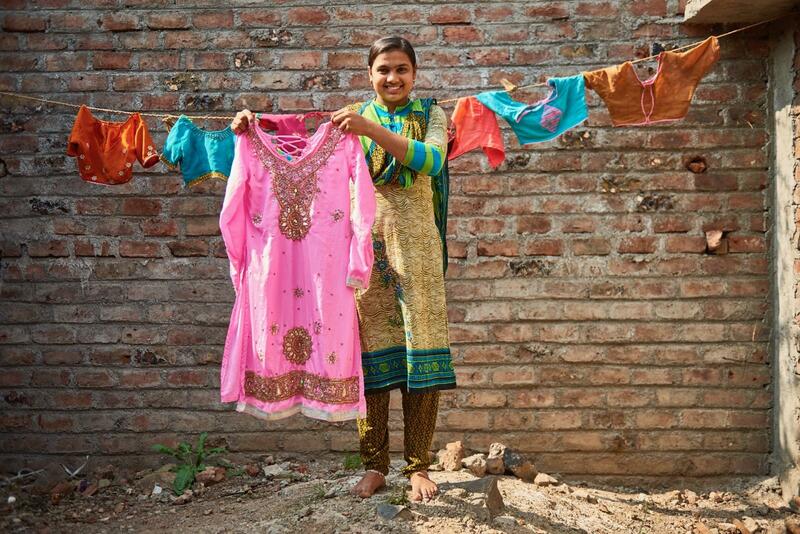 Saima is just 16 years old, but really she should have quit school and got married years ago. Instead she’s studying and fighting for girls to be allowed independence and to be treated with respect. My dad was first asked by another family if he wanted to marry me off when I was 13. It was followed by lots of other proposals. But my dad kept saying no. He explained that there will be no wedding until I’ve been in education for 15 years, and that means that he thinks I need to have finished university studies first. Wages pay for school books and bus tickets: “I charge between 100 and 200 rupees per garment, depending on the type of work,” says Saima. “I’m now leading the Girls Club in our village. As a peer leader, IHMP has given me the chance to go on courses on how to use a tablet, and now I’m teaching other girls about how to search for information online and I can access loads of news and knowledge in this way, so that us girls know what’s happening in society and in the world. Saima teaches the girls how to use a tablet and access the internet. “Ashok’s organization also helped me go on a course in sewing, with a certificate showing I completed the course. I wanted to go on the course because I like clothes, but also to know that I have vocational training. That’s really important for a girl because then we can earn our own money, which makes us more independent and on an equal level with men.